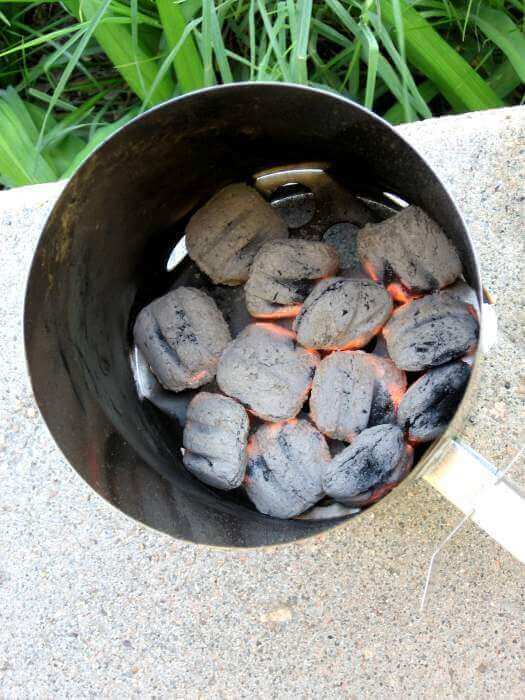 It's smart to use a charcoal chimney for lighting charcoal for your grill or smoker. Smart because you're not adding petroleum flavors to your food by using charcoal lighter fluid. 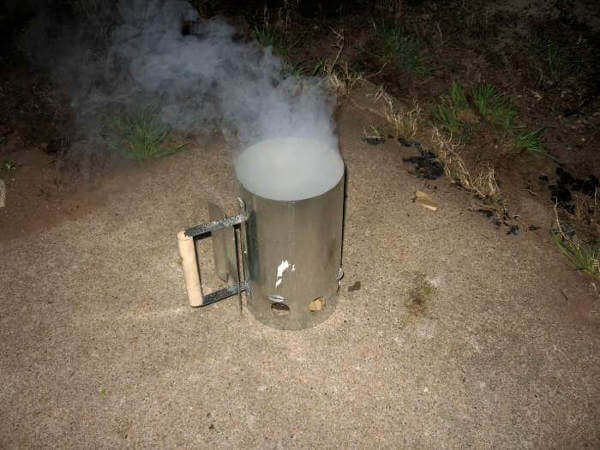 Lighting charcoal in a chimney starter is very easy to do. And the charcoal is ready more quickly than if you started it in your grill with lighter fluid. The reason? When the charcoal starts burning, it creates an updraft. The moving air fans the flame, making it burn even hotter. And as the coals get hotter, the air rushes past faster, which gets that charcoal white hot in minutes. 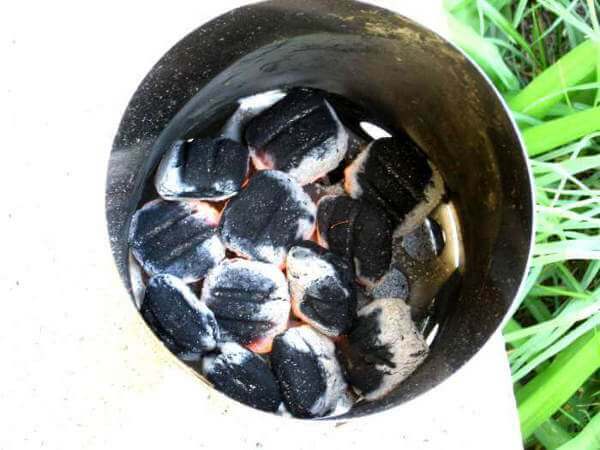 Whenever you use lighter fluid on the charcoal in your grill, most folks don't even think about the fluid that doesn't soak in the coals, running off into the bottom of the grill. That's the fluid that remains after the coals are burning nicely, and that's what will contaminate your grilled foods. By using your chimney, lighter fluid flavor isn't an issue. Fill the chimney with as much charcoal as you need to get the job done. It could be only 10 or 15 briquettes, or it could be a full chimney depending on how and what you're cooking. The underside of the charcoal chimney has a space for placing crumpled paper. The paper is ignited, and with the chimney safely sitting on a concrete or other non-flammable surface, the flames rise up through the pile of briquettes, lighting them. It won't seem like much is happening at first. Only the edges of the briquettes will be burning at the beginning. But it will spread quickly. If after 5 minutes you don't see much happening, place a second piece of crumpled paper in the bottom of the starter and try it again. A second time is usually the most it will take. As for the type of paper to use, newspaper works well, as do pieces of brown paper bags. I stay away from using paper that has been printed with colored inks because I heard somewhere in the past that the colored inks were more toxic than black newsprint ink. Is that true? I don't know for sure. It's just one of the little rules I live by. You can see that this chimney isn't filled very full. I'm using this charcoal to top off unlit charcoal in my grill, a method that provides an extended cooking time at barbecue temperatures. Peeking into the chimney, you'll notice that the charcoal isn't completely ashed over yet. There's a good burn going on at the edges of the coals, but they're not yet ready to be put into the grill. That's more like it! The charcoal is completely ashed over, and beginning to burn very hot. It's now ready to dump into the grill. The unlit charcoal these coals are going onto have a few chunks of smoker wood mixed in for flavoring the food. When using wood this way, with the hot coals on top, the chunks don't normally burst out into flame. If they do, just smother them with a doubled over piece of heavy duty aluminum foil. If you spray water on the flames, a swarm of ashes will rise, coating your food with black dust. It will take a bit longer light charcoal in a fully loaded charcoal chimney, but it will still be quicker than if you lit with fluid.